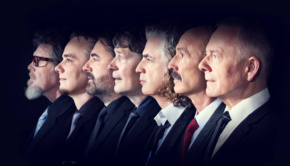 There are loads of great bands out there, and then there is King Crimson; from their earliest incarnation a method of approaching music rather than a musical group in the traditional sense. We’re currently in a Golden Age of KC, tour after tour, meaning that having waited 15 years to see them again I’ve had the pleasure three times in as many years. 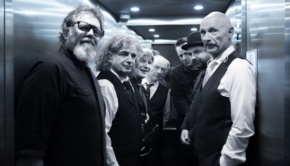 I didn’t see that coming, and that inveterate tease, “Chuckles” Fripp, continues to bamboozle his admirers, not least by adding drummers to the line-up as if they were going out of fashion. Three might be considered by many to be excessive, but Bob has proved that it can be done, and supremely well at that. ‘Expect the unexpected’ has always been the watch phrase for all things Krim and this year we get a “double quartet” formation: drums cubed, guitars squared, vox, wind, bass/Stick, keys/Mellotron, spoons, kitchen sink and Tupperware. With Bill Rieflin back in the band to handle keys and Mellotron, the 16-armed Beast has to be one of the most impressive arrays of musical muscle ever gathered together and now have even more scope to reinterpret a repertoire that only the most fervent optimist could have expected to hear played by the band again. Second night proper of the U.K. tour and here we are as the well named Uncertain Times tour rolls into Cardiff on a damp but not too cold Halloween. If the band choose to emerge from enormous pumpkins it would be just oh so right. 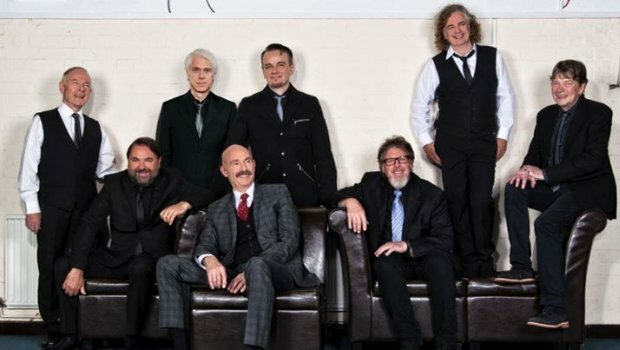 In a world where nostalgia is where the big bucks can be found, King Crimson remain at the cutting edge, where they have been from the very start. An amazing 50 year achievement, Fripp’s decisions to fold the band and reanimate it only when the time, mood and music are right paying dividends over and over again. There is a sense of expectation in the air and the three minute warning has the faithful rushing to their seats like a hoard of excitable puppies. 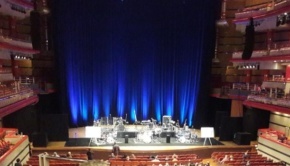 Entering the hall it’s the three drum setups across the front of the stage that immediately grab your attention, a raised platform behind for the other five members with Fripp, as usual, far right. We get the traditional jovial welcome over the speakers from Robert, inviting us to join in the party, but only to photo and viddy with our eyes and brains until the last note has been played. This appears to be well observed throughout the show. The lights dim, but only a bit as this is an evening for band and audience to share the moment with no barrier of darkness; this is a band that does not need a light show or effects, the audience hanging on every note and movement. They take the stage in an array of suits, synonymous with the current image, led by Pat Mastelotto, Fripp bringing up the rear, each to his space, quietly acknowledging the appreciation. They look relaxed. A few moments of settling, Fripp straps on his guitar and kisses it, some introductory recorded studio chat and we’re off, the front line of Mastelotto, Jeremy Stacey and Gavin Harrison throwing down a hefty gauntlet of synchronised drumming. The way that these three work together is evolving all the time and feels like it’s firing on all cylinders at the moment. With Gavin as the master technician and Pat the experienced improviser, Stacey and his bowler hat take a position, quite literally, between them, also adding some lovely piano when required. It’s fascinating from the start and they get a good workout to bed themselves in before a sparkling version of The ConstruKction of Light, the Belew era featuring significantly in the set this time. The sound is superb, every contribution audible with no need for excessive volume. Everyone seems comfortable and ready to go with a particularly wacky take on Neurotica, with spiky additions from Mel Collins and a first vocal from Jakko Jakszyk, taking us to a selection from the very first Krimson album. Half a century on, Moonchild is a delicate and haunting antidote to what has preceded it, The Court of the Crimson King making a majestic entrance to follow, a skilful take as is everything this band choose to do, before Larks’ Tongues in Aspic (Part IV) returns us to the sheet metal brilliance of the band’s later work. And now for something completely different. Hands up who expected a 20-odd minute suite from Lizard? It is riveting. Lizard has been an album that languishes in my collection, I haven’t played it in years, but I sure as hell did the day after this show. Cirkus is a piece that suits this incarnation very well, Mel getting a good opportunity to blow, but following this with an updated reinterpretation of the album’s second side is a revelation. It underlines the softer edge to much (but not all) of this first half in a beautiful and enigmatic work that allows the band to play very differently from much of the rest of the set. Gavin sets the initial bolero rhythm, the selections emerging in a slowly evolving suite to fade with Fripp’s final lament. Just wonderful. The surprises continue in a take on Indiscipline that features sung words and wonderful improvisation between the drums. Fascinating stuff, they’re clearly enjoying playing together and the rest of the band clearly enjoy watching the interplay from the best vantage point in the house, with smiles all round. Jakko brings it to a close with a resounding “There’s Lovely!” in the slot generally used for “I Like It!”, giving the Cardiff crowd a chuckle. Bringing the first half to a close, a cleansing version of Islands that highlights what a marvellous song this is, a hidden gem from its parent album. Interval: time to recap. Phew! People are looking around in a bit of a daze, it has been breathtaking so far with brilliant playing, unexpected treats and Robert appearing to smile quite frequently. And well he might, this band just get better and better. 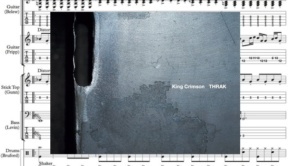 With a serene and almost expressionless Rieflin back, the Mellotron work is much more apparent, and with Fripp also frequently adding even more this is something of a ‘Tron fest for any fan of the venerable old instrument. Jakko is in fine voice and his guitar complements Fripp’s spectacular work throughout. Collins and Tony Levin are masters of their chosen instruments, Tony’s inimitable playing switching between bass guitar and Chapman Stick, Mel’s array of saxes and flutes being brought into play in often unexpected ways, in pieces where brass did not originally feature, making this the jazziest version of KC ever. And it is wonderful to see Fripp at the heart of the band again, rather than hiding in the shadows, his fluid, often coruscating lines fill me with awe. An enigma and visionary of impeccable stature, one of the last real legends, at 72 years old his playing is still unique and extraordinary. And we’re back. Eyes down for more of the same in the second half, only bigger! The drum buddies give themselves another good workout, Radical Action (To Unseat the Hold of Monkey Mind) banging and clattering, the drum line thranging through, feeding off each other in a display of teamwork second to none. Amid it all we get a startling Meltdown before Larks’Tongues in Aspic (Part V) (or Level Five as it is more commonly known) brings the band back to the latest studio release under the KC banner, a ferocious slab of venomous intent, which is followed by a heartbreaking take on Epitaph, Jakko again doing a fantastic job, as he does on a stonking Easy Money, the drums once more getting a good hammering before the interlocking loveliness of Discipline. The volume is noticeably raised in this second half, underlining the intensity. You really don’t know where to look, it’s sensation after sensation, every man playing as if his life depended on it. You probably do need to see this show eight times to capture it all, all of the performers worthy of your full attention throughout, whether they are playing or not. When the unmistakable sound of Starless kicks in, Levin’s commanding presence is immense, Pat sitting, eyes closed, absorbing it all. It all leads to the only change in lighting during the whole evening as the band are bathed in a fiery crimson, and Fripp’s howling guitar owns the second half of the song. A fantastic version of a classic song that demonstrates the power of a band fully bedded in and playing as a well honed unit. The crowd go nuts, the band smile and wave, heading off briefly before returning for an encore of the obligatory 21st Century Schizoid Man, complete with a highly innovative melodic solo from Harrison. He really does raise his already stupidly high game in this setting and his drum buddies clearly appreciate his efforts. The psychotic end section is brilliant, culminating in all three drummers on their feet. 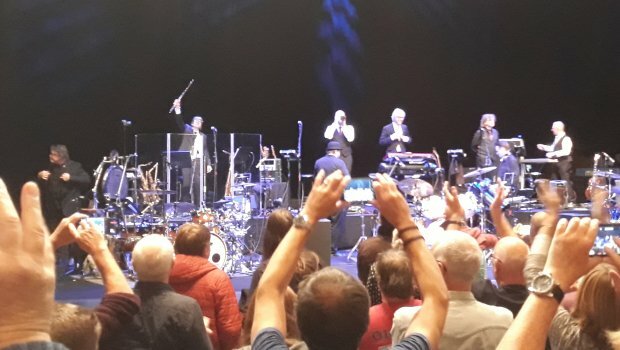 Levin reaches for his camera, the previously agreed signal for everyone else – including Fripp – to reach for theirs to capture just one small part of this extraordinary evening. Fripp smiles. The band smiles. We grin like Cheshire cats! As my colleague Mel Allen noted, KC take 20th Century music and give it a 21st Century twist.